Keeping track of vaccinations dates can be a chore sometimes and you might worry about your pet experiencing pain when they get shots. 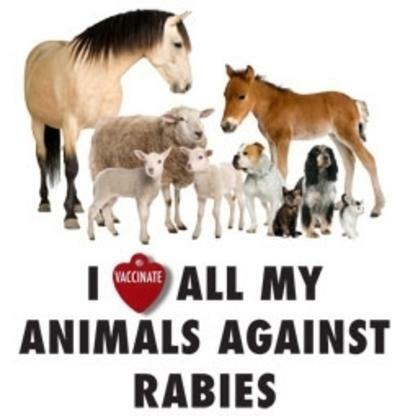 The fact is, though, that vaccines are by far the better option compared to the risk of catching the rabies virus. So, who can get rabies and how is it transmitted? How do vaccines protect your pets and yourself? Can you take preventative measures beyond just the vaccine? Read on below to find out. According to the Centers for Disease Control and Prevention (CDC), rabies “is a preventable viral disease of mammals.” Rabies is transmitted through an infected animal’s saliva, which infects the victims through a bite or open wound. It is considered one of the most dangerous diseases on Earth because of its extremely low survival rate: .1%. Because of its impact on the brain, behavioral changes, such as aggression, may present itself and the victim could be struck by paralysis. This describes furious and paralytic rabies, respectively. The rabies vaccine can prevent the virus from taking hold in a potential victim if administered pre-exposure. The vaccination can even keep it from becoming symptomatic post-exposure if treated soon enough! The rabies vaccine was first discovered in the 1880s in France by a scientist named Louis Pasteur. It wasn’t long after his discovery that alternative vaccines for rabies were developed and put to use. The current rabies vaccine, as with other available vaccines, works by prompting the creation of antibodies. An inactivated or dead version of the rabies virus is responsible for this: the dead virus cannot cause any disease but immunity is stimulated by it! It’s easy to see, given all of the information above, that the rabies vaccine is one of the best preventative measures pet parents can take, both for their pets and themselves. There are other things you can do to lower the risk of your pets becoming infected with rabies or any additional illnesses so we recommend the following in addition to vaccination. 1. Supervise your pets while outdoors. If you notice any strange wounds or suspect an interaction with wildlife that could affect your pet, contact your veterinarian immediately or consider taking them in right away. 2. Be mindful of stray animals. If there are a lot of stray animals in your area, you could find out if there are any local programs for their vaccinations. You might also want to consult a local no-kill animal shelter as well. Ultimately the rabies vaccine is your best line of defense against one of the deadliest viruses in the world. If you haven’t vaccinated your pet already maybe you want to observe World Rabies Day (September 28) and make an appointment to get the vaccine today by calling us at (703) 378-9791! Let’s work together to ensure all pets are kept healthy and safe.